A memorial commemorates all of the Covenanters who suffered during the years of persecution. 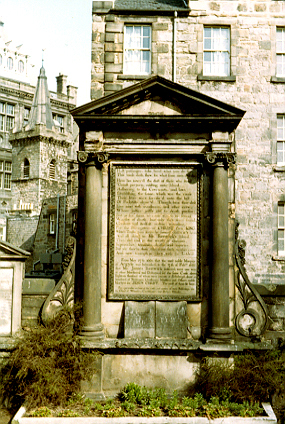 The Covenanters' Monument in Greyfriars kirkyard is located against the perimeter wall. It is a listed building and unfortunately no recutting or replacing of the stonework is allowed. The SCMA has paid for maintencance on the memorial to stabilise the fragments of stone, and a plaque has been erected alongside replicating the inscription. This took place in 2005, and the work was completed with the assistance of Greyfriars Kirkyard Trust.